©2005, 2016 CinemaTechnic, Inc. All rights reserved. Since the introduction of the Carl Zeiss Super Speed prime lenses for 16mm cinematography in the late 1970’s, there have been no new prime lens designs from the major cine lens manufacturers – until now. Responding to the greatly increased popularity of the Super 16 format in 2004, the two major manufacturers of cine prime lenses for ARRI cameras, Cooke Optics of England and Carl Zeiss of Germany, introduce the next generation of high performance optics for Super 16. All 35mm format lenses cover Super 16 format. As focal lengths go below 20mm, it becomes increasingly difficult to design 35mm format wide angle lenses. Size, complexity and cost of 35mm format lenses increase dramatically with shorter focal lengths. A 10mm prime with Super 35 coverage cost double the price of a 20mm from the same lens set. Certain optical design compromises have to be made in order to make a S35 format super wide angle lens. This does not allow the designers to concentrate all the optical quality in the center of the 35mm image which would account for the entire Super 16 image. At focal lengths of 50mm and above, there is little to gain in reduced size and complexity by designing lenses to cover only the 16mm format. It makes more sense to manufacture a 35mm format lens that can also be used for 16mm with no loss in quality. With older prime lens designs, it was known that dedicated Super 16 lens designs could outperform their 35mm format counterparts up to 25mm focal length. The break-even point of equal performance seems to be about 35mm F.L., and testing of two 50mm T1.3 prime lenses, one for S16, one for S35 format, showed that the differences at this F.L. were so slight as to be undetectable. With the increased optical performance of the next-generation S35 format lenses, this break-even point drops to a 16mm F.L. These new prime lens sets are designed to be used along with 35mm format lenses for focal lengths of 16mm and above (14mm at the moment with the Cooke SK4). With a history dating back to 1893, Cooke lenses have been a part of the history of cinematography since the very beginning. Originally known as Taylor, Taylor & Hobson, of Leicester, England, they began making the still famous Cooke Speed Panchro cine lenses in 1921. Cooke has been supportive of the Super 16 format, and they introduced the first Super 16 zoom lens, the 10.4-52mm Variokinetal. In 1998, Cooke Optics became an independent company, entirely dedicated to the manufacture of cinematography lenses. Shortly afterward, they introduced the Cooke S4 series of prime lenses. These represented the only new complete prime lens set for ARRI cameras from a manufacturer other than Carl Zeiss. The S4 prime lenses have an entirely new mechanical design. They do not have any focus threads. Instead, the optics are held in an inner housing which is held by bearings inside the outer housing. Focus movement is controlled by a rotating cam. This design has the advantage of eliminating the problems of play and wear that plague focus helix threads. Also, the cam movement is non-linear, which allows more room between focus marks located close to infinity. The outer barrel of the lens does not move during focusing. The new SK4 primes for Super 16 utilize the same mechanical design and housing as the 35mm S4 lenses, and have the same external dimensions. Each lens is assembled by an individual technician. The focus scale and T stop scale are marked individually for each lens, based on careful measurement. This assures the exact accuracy of the focus scale. Carl Zeiss has been a partner with ARRI for many years. Zeiss introduced the first high performance prime lenses for the 16mm format, the Super Speed series. The original Super Speeds were introduced in mid 1970’s. The set consisted of 9.5, 12, 16 and 25mm focal lengths, all with a maximum aperture of T1.3. In 1998 Carl Zeiss introduced the Ultra Prime series lenses. These lenses used an improved mechanical design compared to the older Zeiss cine lenses. The double helix thread was dropped in favor of a single helix with a durable Acme thread and a linear track replacing the guide forks used on the older lenses. The Ultra Primes are an internal focus design. The outer barrel of the lens and the front element group are stationary during focus. 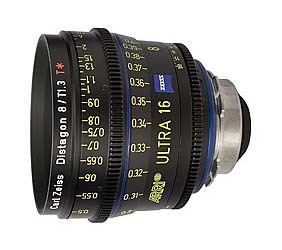 The Ultra 16 lenses have the best optical performance of any lenses ever made for the Super 16 format. Zeiss technicians consider them the best lenses they ever made.